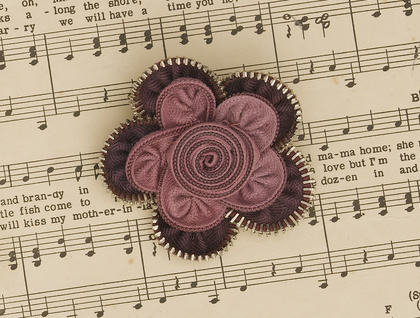 Boysenberry Swirl Wonder flower Brooch is carefully stitched from vintage zippers. This flower is made from vintage zips carefully hand sewn together ,the outer petals are made from dark boysenberry zips while the inner is made from lighter boysenberry cream zips. The reverse side is neatly finished with felt and a hand stitched brooch clasp attached. Looks great on a coat, jacket, hat or even bag, a perfect flourishing finish to your favourite outfit.